La La Land may have not won best picture, but we doubt you can sing-a-long to Moonlight. 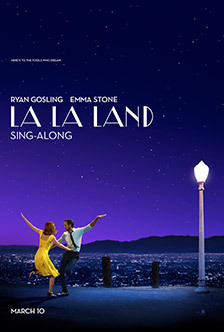 The La La Land Sing-A-Long starts March 10th, allowing fans to fully break into the songs from the movie instead of having to do it at their homes with the Blu-ray or Stream release. Just announced, was the La La Land In Concert: A Live-to-Film Celebration happening Friday, May 26, and Saturday, May 27, at the Hollywood Bowl. So if you want an even more lively affair head to the Hell that is parking at the Hollywood Bowl to enjoy anything. Hear a live 100-piece orchestra, choir, and jazz ensemble.